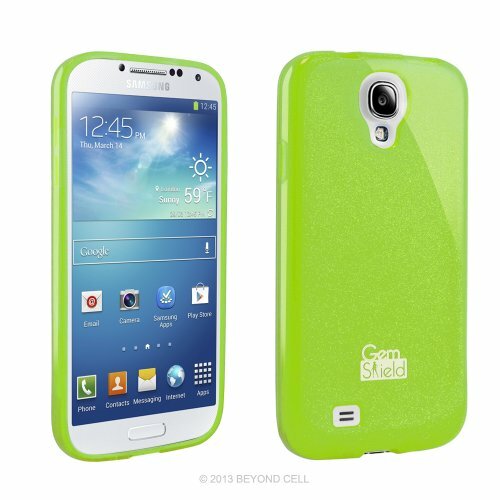 In this review I’ll be reviewing the Gem Shield TPU case by Beyond Cell for the Galaxy S4. This case is actually available in over fifteen different colors so be sure to check out the link in the description for more on that. This is actually one the simpler better cases I’ve reviewed for the Galaxy S4. Many cases just seem to overdo it by adding extra features that make the phone too thick or just makes the phone plain ugly. This case is very simplistic, when I say simplistic I mean it serves a specific purpose and it does what it does perfectly. This is an ultra slim case that protects all aspects of the phone. It gives full access to all the buttons, rockers, and ports. The only thing I don’t like about the case is that it has this glittery effect to it and the branding on the back definitely shows that it is targeted towards girls. I honestly wish BeyondCell would make this case in a solid color with their normal branding. This case also does more though, it’s very easy to put on and take off. As you can see here it is made of what BeyondCell calls a semi-hard and semi-soft flexible TPU material. I also like that BeyondCell added a slight lip. Overall, this is a very complete case that I am a fan of. Would I use it? No, because this is obviously a girls case, but it is a good one. If you would like to learn more about this case feel free to check out the links in the description and don’t forget to share this video and also don’t forget to subscribe to my YouTube channel. A huge thanks goes out to BeyondCell for providing this case for review.